Angul: Young athletes’ of O.P. 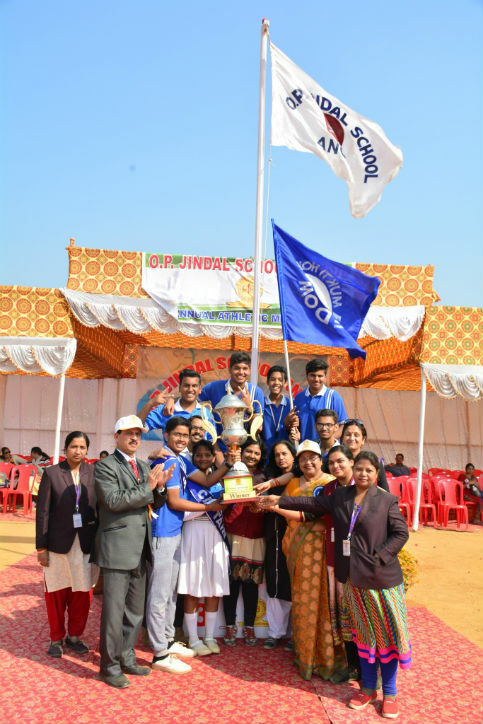 Jindal School rose to prominence with their spectacular performance as the School celebrated its 7th Annual Sports day on January 06, 2017. Executive Director (I/c) and Location Head of the Angul unit of Jindal Steel and Power Ltd. (JSPL) Mr. Dinesh Kumar Saraogi extended his warm wishes to the school management committee, staff members and students for their Annual Sports Day. Mr. Dinesh Kumar Tripathy, EVP-Plate Mill, graced the occasion as Chief-Guest and hoisted the School flag followed by School Song, torch rally and oath. Mr. Chhanda Charana Das, Principal of the School in his welcome address appealed the parents and the teaching faculty to encourage the learners towards their favorite sports. Under the deft co-ordination of Dr Rishi Awasthi, PET a host of events including Mass Drill, shot put, taekwondo, rally race, lemon race, long jumps, high jumps, balloon busting and so on were conducted for both boys and girls with great enthusiasm. All the Houses: Bhakti, Mukti, Riti and Shakti had an overwhelming presentation on the occasion. “Mukti” House emerged as the Champion team and RITI became the Runners-up. Mrs. Sujata Saraogi, President-JMS graced the occasion as Chief-Guest of the valedictory ceremony and handed over the prizes to various winner and runner-ups of the sports meet. Mrs. Sangeeta Sharma and Mrs. Gouri Sahu accorded vote of thanks to one and all.